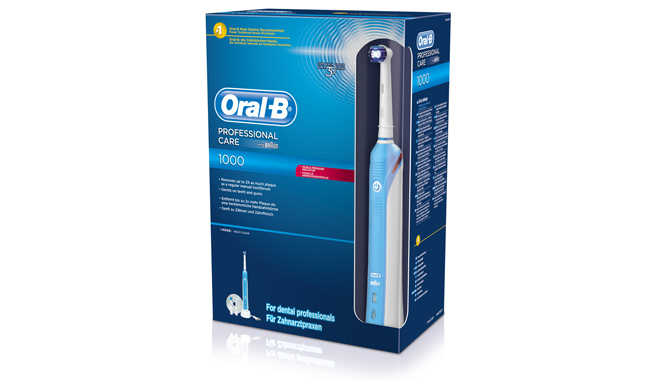 The Oral-B Professional Care 1000 Electric Toothbrush is the newest in the series of mechanical toothbrushes introduced by Oral-B. Priced at $60, much lower than its competitors, this mechanical toothbrush has gained quite a bit of popularity. Designed with a unique round brush head and rubberized body for a more firm grip, the Oral-B Professional Care has definitely got some great features. Here are some I find quite impressive. Its brush head. The revolutionary thing about this toothbrush is definitely its brush head. With rubber flaps that actually floss the teeth and bristles that effectively remove plague, the small brush head is perfectly designed to remove up to 50 percent more plague than a regular tooth brush. While surprisingly small, the brush head actually encompasses each teeth, even the molars and cleans thoroughly. The smaller head works towards more effective cleaning. There are 4 heads to choose from, Precision Clean which is included, Floss Action which has slightly longer rubber flaps, Pro White and Dual Clean. Its Inductive charging base. The base has two indicator lights, which let you know when to charge the brush. I like this feature because I hate having a dead toothbrush right before bed. The inductive base is also designed much smoother and with minimal design or ridges, which means no trapped dust or water residue. The base is also easy to grip, lightweight and not very bulky. Minimum effort. While the Oral-B Professional Care 1000 does require patience, as it has to be used for at least 2 minutes, but it requires minimum effort. The pulses are quite efficient in plague removal and the brush does not require too many twists and turns of the wrist. Half of the base is rubberized so the brush is easy to hold and grip. On the downside, the Oral B 1000 is quite noisy unlike Oral B 3000. It can be heard outside the washroom, which is something I find quite annoying. It only charges in 130 volt outlets, so if you travel a lot you have to switch to a regular toothbrush. The much advertised pressure sensors are not very effective. When I brush, I do not even feel them getting lighter. Because of this I keep on brushing, not realizing I might be pressing too hard and damaging my gums and the brush head. Often the brush just stops pulsating when I am trying to clean between my teeth. Not exactly very sensible. Overall it is a pretty good buy, I would definitely recommend it, just remember to brush light it does not require as much effort as an ordinary toothbrush.